Security Auditing of an enterprise – whether in an extremely large organization or a smaller one is one of the most important concern pertaining to protect your confidential or private data from hackers eyes. Unauthorized file access, falsification and even deletion and modification of files & folders has become a common phenomenon in organizations where it becomes difficult to audit events, track malicious user actions & monitor illegal access. Companies from varied sectors operating globally with distinct departments often needs to communicate. For this, they need to implement a centralized auditing solution that also possesses capabilities to monitor and review changes to their important file system resources while also securely tracking all the file server events like file creation, modification and deletion. An advanced security solution not only helps them to track who is accessing their sensitive information round-the-clock but also detects whether they’re at serious risks of malicious file access events or careless actions from the network users. Through LepideAuditor for File Server (LAFS) – an industry popular tool that possesses monitoring & auditing capabilities, many global companies were able to report and track usage of all the sensitive files on its Windows network. With increased reliability on file servers in order to store important documents, IT administrators entrust LAFS’s advanced file server auditing technology in maintaining security of data via regular security audits. From “tracing folder access in a network” to enable round-the-clock “file and folder”, LepideAuditor For File Server facilitates detection of any kind of malicious file access events that intend to open a particular file or modify it for illegal purposes. Mitigate Risk of Data Loss & Theft – In an extremely huge organization with considerable number of departments and also a large number of employees where a large number of files and folders are accessed on daily basis, it is not at all possible to keep track of every file opened by a particular user at a particular period of time. In such scenarios, LAFS tracks unauthorized access and notifies the company’s IT administrators whenever any inappropriate access of important files & folders occurs. With LAFS’s monitoring & auditing capabilities, one can avail reporting features while also eliminating potential high risks of data loss and theft. 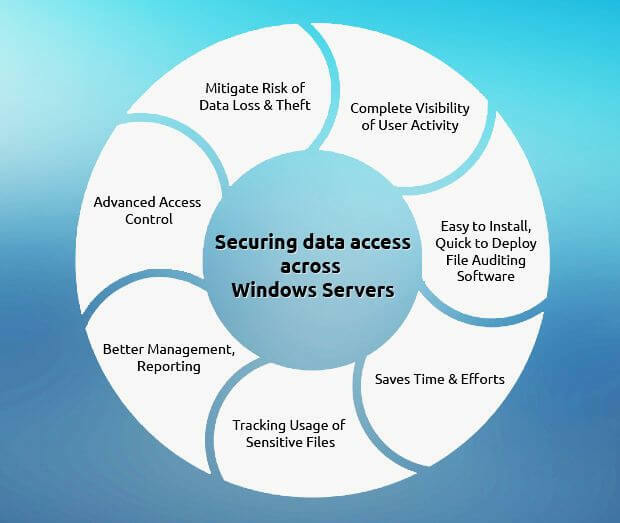 Advanced Access Control– Monitoring & auditing file access events across Windows servers with LAFS gives complete control over every changes made by users, be it complete control over every changes made by users, be it file creation, deletion or modification. Besides this, the software package also helps in tracking & monitoring file server changes answering “Who”, “What”, “When” & “Where” questions regarding any changes made by a particular user in both Windows file servers and NetApp filers within the network. Better Management, Reporting & Tracking Usage of Sensitive Files – Advanced file auditing, monitoring & reporting capabilities of LAFS helps the companies to better manage & track illegal usage of sensitive files comprising confidential data via filtering file access events by type, user account or time range. Saves Time & Efforts – Monitoring & Auditing file access events with LAFS also reduces the wastage of time and energy that is related with manually searching ‘n’ number of logs related with file server activities. Easy to Install, Quick to Deploy File Auditing Software – LAFS is easy to install & quick to deploy with basic system requirements. With a simple user interface, this file auditing software is absolutely easy-to-use. Complete Visibility of User Activity –File monitoring & Auditing features of LAFS also offer accurate and comprehensive information on all access events across the system. Through schedulable, automated and multi-criteria reporting, the software allows complete visibility of all user activities or actions across the company’s Windows file systems & NetApp filers. File monitoring & auditing is crucial for maintaining File server security & integrity. It is also one of the best way to safeguard and secure file access within an organization. Hence it becomes comparatively easier to visualize user activities, track malicious actions, be informed of unauthorized accesses and know what’s happening with all the sensitive files across all Windows servers. 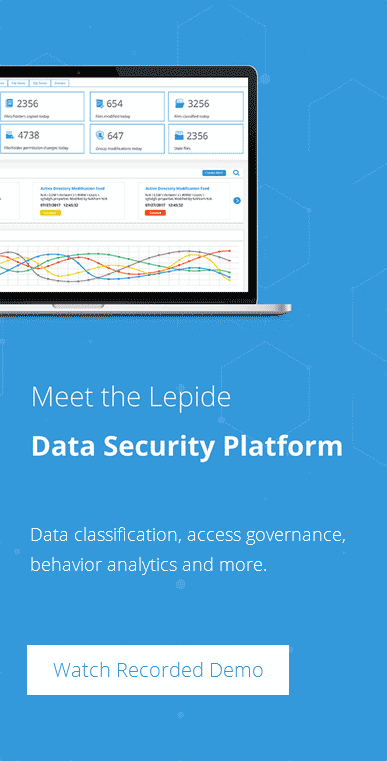 By monitoring all the file access events with auditing software like LepideAuditor for File Server ( http://www.lepide.com/file-server-audit/ ), one can easily track malicious actions and see who has made changes to their files and folders.